30/09/2015 – New members of WCAG! # 155, DK8RE Hans-Jurgen Doring. 30/09/2015 – WCA & COTA-DL pedition of DH0KAA/P to Castle Eichholz! – Ingo DH0KAA will be active on the 30th of September 2015 from Castle EICHHOLZ, WCA: DL-03790, COTA-DL: KAB-043 in DLFF-102 Naturpark Rheinland. He plans to work as DH0KAA/P beginning from 13:30 UTC on 40 and 20 meters. QSL via Home Call, bureau or direct. 73 & 11! 28/09/2015 – WCA & CCA pedition of OK2APY/P and OK1APY/P to Castle Veveří, WCA OK-00259 and OKFF-0639! 27/09/2015 – WCA & COTA-DL pedition of DL0KK/p to Castle Landgut Steeg and Castle Haus Issum! 26/09/2015 – WCA & COTA-DL pedition of DL8MLD to Jagdschloss Possen! 25/09/2015 – WCA & COTA-DL pedition of DL2RUF to Castle Elgersburg! – Juergen DL2RUF will be active on the 25th of September 2015 from Castle Elgersburg, WCA: DL-01379, COTA-DL: THB-085. He plans to work as DL2RUF/P beginning from about 08:30 UTC on 40 meters. QSL via Home Call, bureau or direct. 73 & 11! [tnx info DL2RUF]. 24/09/2015 – Photoreport about pedition of CR6AG to Alegrete Castel, WCA: CT-00096! 23/09/2015 – WCA & BCA pedition of ON4VT/P to Chateau de Durbuy! – Danny ON4VT will be active from the 23th till 26th of September 2015 from Chateau de Durbuy, WCA: ON-01221, BCA; LU-101. He plans to work in holiday style as ON4VT/P. QSL via home call, bureau or direct. 73 & 11! [tnx info ON4VT]. 22/09/2015 – Photoreport about pedition of F5NLX/P to Fort du Loch, WCA: F-02426, DFCF: 56-032! 20/09/2015 – WCA&COTA-DL pedition of DL1JKK to Castle Glauchau! – Karl DL1JKK will be active on the 20th of September 2015 from Castle Glauchau, WCA: DL-01259, COTA-DL: SAX-153 (New one). He plans to work as DL1JKK/P beginning from about 07:00 UTC on 40 and 20 meters. QSL via Home Call, bureau or direct. 73 & 11! [tnx info DL1JKK]. 19/09/2015 – Photoreport about pedition of LZ2HT/P to Peklyuk Fortress, WCA: LZ-00155 ! Equipment was situated about 600 meters away from the Fortress at panoramic view area. Decided not to try off-road to get closer. Total 52 QSO – PSK31/63 mode. RIG FT-857D, 15W. Antenna SOTAbeams linked dipole 20/40 meters, 6 m o.g. . Tablet Lenovo A2107 with DroidPSK. 19/09/2015 – WCA & S5-WCA pedition of S59DMN/P to Castle Mali Gradu! On saturday 19.09.2015, from 7h UTC radioclub Kamnik S59DMN will activate castle Mali gradu from Kamniku reference WCA S5-00041. They will work on 2m and HF. Hope to hear you and please some spot. 19/09/2015 – WCA & RFA & RHO pedition of YO6EX/P to Valchid Fortified Church! – Vasile YO6EX will be active on the 19th and 20th of September 2015 from Valchid Fortified Church (built XIV Century), WCA: YO-00476, RFA/RHO: SB-F59. He plans to work as YO6EX/P by CW on 7040, 10124, 14040, 18084 +- QRM, by RTTY: 10142, 14080 (please short QSO), PSK: 10142, 14070 (please short QSO). QSL via bureau or direct. 73 & 11! [tnx info YO6EX]. 19/09/2015 – WCA & COTA-RU pedition of RZ1CWC/M to Fort Ino (Nikolaevsky)! – Andrey RN1CW is going to work on the 19th of September 2015 from 8 till 9 UTC from Fort Ino (Nikolaevsky), WCA: UA-00201, COTA-RU: F-107, RDA: LO-24 and possibly from 10 till 11 UTC from Karelsky fortified, WCA: UA-00255, COTA-RU: U-101, RDA: SP-10 and from Mannerheim’s Line, WCA: UA-00543, COTA-RU: U-119, RDA: LO-24. He plans to work only CW on 14.041 Mhz and 7.021 Mhz +-QRM as RZ1CWC/m. QSL via Home Call, bureau or direct. 73 & 11! [tnx info RN1CW]. 19/09/2015 – WCA&COTA-DL pedition of DL0HWI to Castle Slawenburg Warin and Castle Slawenburg Blankenberg! – The friends of the club station DL0HWI are going to be active on the 19th and 20th of September 2015 from Castle Slawenburg Warin, WCA: DL-03481, COTA-DL: MVB–285 and Castle Slawenburg Blankenberg, WCA: DL-03581, COTA-DL: MVB–312. He plans to work as DL0HWI/P. QSL via bureau or direct. 73 & 11! [tnx info DL3SUE]. 18/09/2015 – New member of WCAG! # 153, YU1BOR Radio Club “CRNI VRH” BOR. 18/09/2015 – WCA&COTA-DL pedition of DB7MM/p to Castle Burg Schwarzenburg! – Michael DB7MM is going to be active on the 18th of September 2015 from Castle Burg Schwarzenburg, WCA: DL-02819, COTA-DL: BOB-028. He plans to work as DB7MM/P beginning from 12:00 UTC on 7,131 MHz +/- QRM, 14,310 MHz, handheld standby on 145,375 MHz. This activation is also valid for SOTA DM/BM-078 and WWFF DLFF-097. QSL via Home Call, bureau or direct. 73 & 11! [tnx info DB7MM]. 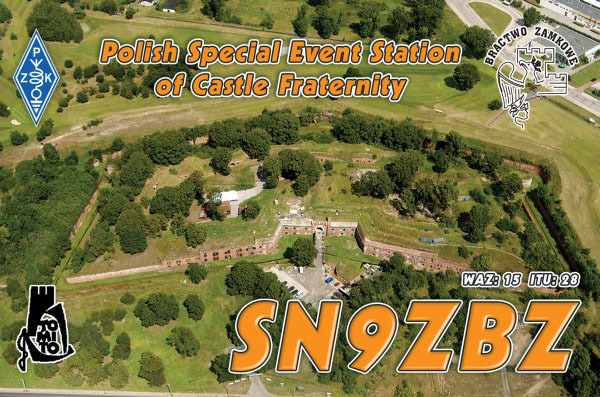 14/09/2015 – WCA & DFCF pedition of SN9ZBZ to Fort IV Stanislaw Zolkiewski! – Operators of Amateur Radio Club PZK “Fort IV” by the Society of Lovers of Torun will be active from the 14th of September till the 4th of October 2015 from Fort IV Stanislaw Zolkiewski, WCA: SP-02192, ZWP: TFP05. They plan to work by special callsign SN9ZBZ. From the 25th till the 27th of September 2015, Eddie SP/ES2TT and many operators work from “IX Congress of the Brotherhood Castle – Torun 2015”. For detail info please visit at QRZ.COM. 73 & 11! [tnx info ES2TT]. 13/09/2015 – New official coordinator of WCA – UPDATE! – Spain: EC5BYB Carlos Purser. 11/09/2015 – WCA&COTA-DL pedition of DG5MLA to Castle Aufhausen! If you hear me then please put me in the DX Cluster, thank you…. QSL via bureau or direct, SWL report welcome…. I hope to listen you all on the air….